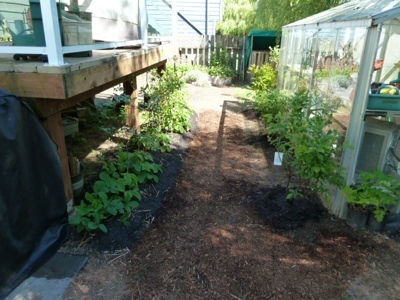 My Home and Garden: The Blueberry Walk. Almost done. The Blueberry Walk. Almost done. My weekend consisted of two hot sunny days. How lucky am I. Today I went out at about 11 am. I came inside at about 2 to use the washroom and bring out a big glass of water. I worked outside until about 6. It was then that I realized I hadn't had lunch. 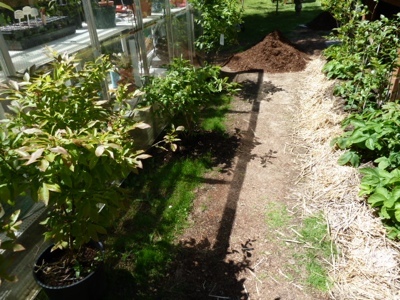 My big must do project for the weekend was get the blueberry walk ready. I had two large bushes to plant. Then I am going to get a few smaller sized ones to fill it. If you remember the walkway had to be moved which exposed some of the blueberries roots. I used straw to shade the roots and keep them moist. The topsoil and bark mulch has taken care of that. Here is a before of the walk. Note the straw and grass. Here with mulch and grass weed-whacked and vinegar treatment. And lastly. The finished result. Well almost anyway. 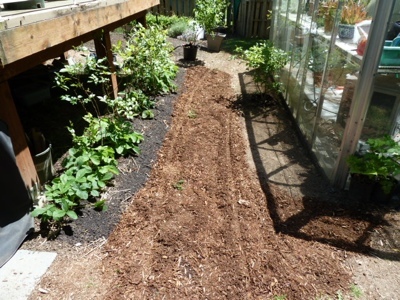 I need to put in the smaller blueberries and then mound them with mulch. The beans are up!! Three types this year. Have you heard of dryer balls? A glorious day in the sun. I got so much done.